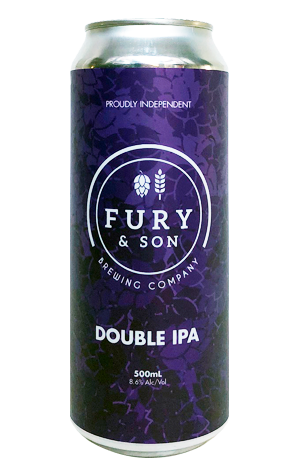 For the release of their first can, Fury & Son aren't messing about. Not only have they gone for tallboys complete with a striking purple label, but they've popped their biggest beer to date inside it: a double IPA weighing in at 8.6 percent ABV. They describe it on the label as "a full-bodied and boozy treat" and they're not wrong. There's plenty of hops crammed in, delivering predominantly piney characters with a touch of citrusy fruit at play too, but there's a solid supporting act in the shape of specialty malts that don't just stop the bitterness from getting out hand, but give the beer a full, smooth passage over the palate. Indeed, the flavours are so intertwined, it's best not to try to pick it apart but just enjoy it for what it is: a big beer for fans of big beers.